For £600-odd, you’re getting a whole lot of Ibanez; perfect for the bedroom or studio. Tone range is merely adequate. Placed squarely at the lower middle of the acoustic guitar market - some distance from the affordable £250 guitars that we all know and love, but a long way away from your £3,000 handmade instruments - this spanking new Sitka and mahogany guitar is a genuine thing of beauty. Adorned with a ‘brown violin sunburst’ finish, one of the nicest ways we’ve seen of saying ‘brown’ in recent times, the AVD10E (it stands for ‘Artwood Vintage’) is accompanied by much PR about its ‘thermo-aged’ X bracing, which we assume means they heated it during construction. This apparently gives the instrument extra volume and frequency range, so we’re looking forward to plugging in and giving it a test drive, although we can’t reasonably be expected to analyse the exact function of the bracing without taking it apart and gluing it together again (something which we’re pretty sure that Headstock Distribution wouldn’t like). The guitar also comes with a cunningly-designed bridgepin design, which may not sound like much until you’re forced to change a top E string in front of an intoxicated crowd demanding to hear Mustang Sally for the seventh time. It’s touches such as this which make a useful guitar into an essential one - so let’s see how it delivers. For £629, you’re getting a superbly-assembled guitar. The spruce top, with its lustrous finish, plus that expensive mahogany back, combine to provide a feel and texture like few other instruments at this price point. Many of the guitar’s features are familiar - the white ivoroid binding, the bridge and scratchplate among them – but there’s an understated elegance to them all. The body, at five inches in depth, is full but not overpoweringly so, and features the usual set neck, a front strap button under the joint (as is so often the case these days) and a rear button that doubles as a jack input. There’s a battery compartment down there, complete with red LED, but there are no controls of any kind - so you’d better trust your ears, your sound guy or preferably both. High points, to this reviewer at least, are the super-small Grover tuners, which are rounded, finger-friendly and lightweight without feeling insubstantial. Again, the machine head design may seem like a mere detail compared to the obvious larger features such as the body woods, but any gigging guitarist will know how crucial they are when it comes to performance efficiency and headstock balance. The neck, a beautifully smooth and slender chunk of mahogany, is also one of the most player-friendly features of the instrument. The fingerboard, with 14 accessible frets of the standard 20, may just be a slab of maple, but it’s hard enough for a satisfying fretting experience while not feeling too unforgiving. The rear finish of the neck is sleek and fast-moving, and the dimensions are very accommodating indeed. We tend to prefer a slim neck profile for ease of navigation, and this one is not only slender, its slight dimensions also extend up to and into the headstock, itself a relatively slim item. Guitarists who prefer a baseball bat-like neck should definitely look elsewhere. Oh, and those bridge pins? Genius. We changed out a few strings to get used to the feel of the bridge, and the design of the pins - grippy rather than slippery - will be the toast of many a live guitarist. If you’ve ever lost a bridge pin down the back of the sofa (or worse, down the back of the stage) then you know what a massive pain it is to fix. Ibanez’s solution may go some way to remedy this. 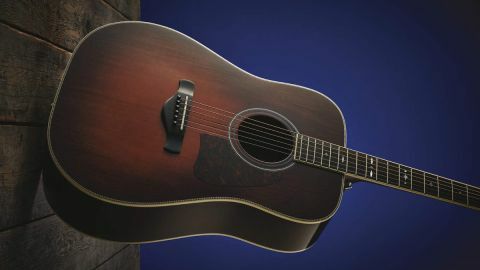 Apply pick to strings and you’re instantly rewarded with loads of volume; this is a dreadnought-sized body, and the decibels that it emits are to be expected, but it’s still a pleasure when a guitar amplifies your playing as readily as this one does. There’s plenty of boom at the bottom end; indeed, the higher mids and top end are slightly overpowered by the Ibanez’s muscular bass response, so if you’re after glass-shattering highs, consider other options. However, we breed reviewers tough round these parts, and just because a scintillating treble response isn’t there on first picking up a guitar, that doesn’t mean we just roll over and give up. Let’s dig in near the bridge with a medium-thickness pick, to start with. Plenty of high mids can be achieved that way, although warmth rather than snap is the central tonal characteristic of this guitar - and there’s only so much you can do. So let’s plug in. Hooked up to your favourite amplifier and played with the amp’s EQ flat, we discover a soothing, smooth tone that rewards the fingerstyle of your choice. Tune down to dropped or straight D and the Ibanez will love you for it, purring along with a warm tone that suits swamp blues and folk. Lovers of DADGAD will enjoy the power behind droned chordal passages, while acoustic punks (think Frank Turner or Ade Edmondson) will admire this guitar’s understated strength. Try playing a doomy number by Black Sabbath or Metallica, ideally assisted by an overdrive pedal, and the instrument really comes to life. Still, if you really do hanker after zippy, cracked-ice highs, you won’t get them here - and sadly, there’s no way around this in the absence of an on-board EQ. Guitarists who are willing to splash out £600 on a guitar are likely to be professional or semi-pro performers, and with that in mind, the ability to roll on mids and treble - the lifesavers in any muddy live mix - is essential. Without these tools, this instrument’s applicability in a live situation is dramatically reduced. A shame, as its design and assembly feels flawless. Ah, let’s be charitable. Sure, there are no tone or volume controls on this guitar, and the tone range is reasonable rather than resplendent - but in both cases, that’s why they invented preamps, right? And plugging in is only one of the instrument’s functions. Play it as nature intended and you’ll be impressed with the organic nature of its sound, assisted by the superb playability and a build quality that seems to go way beyond the usual parameters of this midmarket pricetag. You’ll be more than fine with the splendid AVD10E, whether you’re laying down chords in your bedroom or on stages of any size. We’re impressed with its pricetag and its very playable neck, too. All in all, it’s a fitting entry for the last issue of Acoustic!